Social protest activists set up some 20 tents in a park near the central train station in Tel Aviv, this time approved by the city. Social protest activists set up about 20 tents on Tuesday in a park near the central train station in Tel Aviv. The tents were set up with the approval of the City of Tel Aviv-Yafo. Army Radio reported that the municipality has agreed to provide the protesters with toilet stalls, water supply, lighting and cleaning crews. An attempt to set up unapproved tents on Tel Aviv’s Rothschild Boulevard last Friday resulted in the arrest of tent protest leader Daphni Leef and several other activists. Leef’s arrest sparked outrage, and protesters took to the streets of Tel Aviv on Saturday night, breaking bank windows and battling each other as anarchy hijacked the “social justice” movement. Social protests in Tel Aviv turned violent as demonstrators shattered windows and attempted to break into banks. Some 2,000 people gathered Saturday night in Habima Square protesting against socioeconomic inequality as well as police violence. Eighty-five people were arrested, Haaretz reported. Though the police called to indict some 37 of the demonstrators, the Tel Aviv Magistrates’ Court on Sunday ordered the release of all the protesters, since none of them have a police record. The court suggested that police should have released them for the duration of the proceedings, according to Haaretz. The demonstration spread to banks in Tel Aviv as well as City Hall. Windows were smashed in at least five bank branches, according to reports. The protesters also blocked main thoroughfares in the center of the city. Some 24 hours earlier, 12 activists were arrested in social protests in Tel Aviv, including Daphni Leef, a high-profile activist leader. Protesters in the Friday night protests accused police of excessive violence. Social protest rallies were held in Tel Aviv, Jerusalem and three other Israeli cities. The Saturday night rallies, held also in Haifa, Kiryat Shemona and Pardes Hana, were called the beginning of nationwide social justice protests such as those that took place across Israel last summer. Several thousand Israelis protested in Tel Aviv, with demonstrators marching from poorer southern neighborhoods to Rabin Square. At least nine demonstrators were arrested. Hundreds marched in Jerusalem toward the Prime Minister’s Residence. The rallies were part of an international day of protest to mark the first anniversary of the first social justice protest that took place in Puerta del Sol, Madrid. Rallies in Israel are expected to pick up toward the end of June following the last university final exams. Several hundred protesters marched in Tel Aviv to protest rises in gas and electricity prices, and the higher cost of living. The Saturday night march from Rabin Square to the Tel Aviv Museum of Art came as Prime Minister Benjamin Netanyahu announced that he would cut the excise tax on gas, reducing a planned increase in the price. It is the second time in two months that Netanyahu has held the price of gas just below about $8 a gallon. The protest, under the heading “From Slavery to Freedom,” in reference to the upcoming Passover holiday, came just days after a Bank of Israel report issued last week said that social gaps in Israel widened last year due to government policies. The protest was organized by the same coalition that led last summer’s social justice protests. Protesters also called for Netanyahu’s resignation. Daphne Leef and Stav Shaffir, leaders of last summer’s protests, are both currently on a lecture circuit in the United States raising money for the cause, according to reports. Some 20,000 people gathered in Tel Aviv for Israel’s first social protest in two months. Saturday night’s gathering, joined simultaneously by smaller protests in Jerusalem, Haifa and Kiryat Shemona, among others, attracted a fraction of the 450,000 people across Israel that demonstrated at the end of the summer. A protest in Beersheba was canceled due to rocket fire from Gaza. The Tel Aviv rally began on Rothschild Boulevard, where the first and largest tent city from last summer’s protests was located, and moved to Rabin Square. 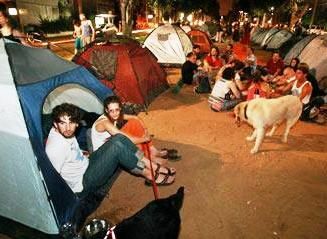 The tent cities remaining in Tel Aviv from this summer’s social justice protests were evacuated. Police and Tel Aviv city inspectors evacuated at least three tent city sites on Monday, as well as empty tents on the main Rothschild Boulevard site. A court injunction prevented a full evacuation of that site. Those who were evicted from the sites are mostly homeless, according to reports. City social workers have spent several days trying to find places for the homeless tent city dwellers, according to the municipality. The municipality said it would establish “dialogue centers” on the sites. Israel’s middle class staged a massive show of strength last night when 405,000 protesters rallied in city streets throughout the country. There were an estimated 292,000 protesters at the largest rally in Tel Aviv, according to figures provided by Trendit to Channel 2 News. The demonstrators marched from Habimah Square at the northern end of Rothschild Boulevard to Kikar Hamedinah, where a major rally was held to protest the high cost of living and demand affordable housing and social justice. At the same time, there were large rallies in Israel’s other major cities. 50,000 demonstrators gathered in Jerusalem, and 35,000 in Haifa as well as protests in Kiryat Shmona, Carmiel, Nahariya, Afula, Ness Ziona, Arad and other towns. There were no protests in Beersheva and Ashkelon because of security concerns. This was the eighth consecutive Saturday night of major social protests, and the largest so far. According to figures provided by Trendit, 62% of the demonstrators in Tel Aviv were from the bottom 40% of the population in terms of income, while 18% of the protesters were from the top 10% of income earners. At the end of the protest she said, “The summer of 2011 is the summer of hope. This hope was borne from the social gaps that have become impossible to bridge. Israeli society which has come here this evening, as well as those who stayed home have reached a red line and has said enough, no more. You can fool some of the people some of the time but you cannot fool all of them all of the time. This summer we woke up and opened our eyes. Some 20,000 demonstrators protested across Israel calling for social and economic equality. The protests Saturday night marked the sixth consecutive weekend that Israelis have marched in social protests. Some 10,000 gathered in Tel Aviv, joined by Noam Shalit, father of captured soldier Gilad Shalit, who said that social justice means bringing all Israeli soldiers home. Jews and Arabs marched together in the Wadi Ara area of northern Israel, demanding not only social justice, but also to not expand a planned development for haredim in the area. On Aug. 26, the five-month doctors’ strike was resolved. “This agreement is an additional step in a series of socio-economic steps that this Government has taken in various fields in order to improve Israeli society and reduce gaps,” Israeli Prime Minister Benjamin Netanyahu said at the start of Sunday’s Cabinet meeting. “We are not neglecting – neither as a result of our security responsibility nor of our economic responsibility – anything regarding our responsibility to implement social reform in the State of Israel. We are doing this. The Trajtenberg Committee is working with all due urgency. It will submit its recommendations to us next month. This is a very serious committee and we are talking about serious and responsible steps. These will not be small steps, but major ones and will be submitted to the Socio-Economic Cabinet in the coming weeks. Ours is a genuine commitment to social reform and the reform we are talking about is both genuine and serious,” Netanyahu said. Tens of thousands of Israelis marched in social justice protests in Israeli cities such as Haifa and Beersheba, but not Tel Aviv. Saturday night’s protests were the first time in the last month that major demonstrations were not held in Tel Aviv. Major demonstrations took place in Haifa with about 30,000 protesters, Beersheba with about 20,000 protesters and Afula with 15,000 protesters. Smaller demonstrations took place in 18 other cities including Eilat, Rosh Pina, Nahariya, Dimona, Modi’in, Petach Tikvah, Ramat Hasharon, Hod Hasharon, Netanya and Beit She’an, according to reports. About 70,000 demonstrators rallied in the protests. Last week, some 300,000 protesters took to the streets in Tel Aviv and Jerusalem to call for affordable housing and other demands for social justice. Prime Minister Benjamin Netanyahu said he will form a ministerial committee to address the country’s economic challenges. The announcement came hours after the resignation of the Finance Ministry’s director general, Haim Shani, who cited a “fundamental difference of opinion” with Finance Minister Yuval Steinitz. It is rumored that Steinitz could lose his job over the protests that are sweeping the country. On Saturday night, more than 100,000 Israelis protested against the high cost of living in cities across Israel, with the largest demonstrations in Tel Aviv, Jerusalem, Beersheba and Haifa. It was the largest turnout for the populist protests since they began about two weeks ago. Meanwhile, activists reportedly are planning a general strike for Monday. Israel’s Knesset will meet in a special session on the rash of protests sweeping the nation. The debate scheduled for next week, which will interrupt the Knesset’s summer recess, was announced Monday after 50 opposition lawmakers signed a petition calling for the session titled “Netanyahu’s tax government is disconnected from the people and ignoring the public protest.” Only 25 signatures were necessary to call the meeting during a recess. The signatures were collected by the Kadima and National Union parties. On Monday, hundreds of senior citizens protested in Tel Aviv against the high cost of living, calling for lower costs for medications, a cancellation of the value-added tax on basic necessities and safeguards on the value of their pensions. Israel, that was supposed to be the state of the Jewish people, has become a haven for the richest and most corrupted Jews from around the world. It is almost amusing to find out that some of the most clichéd Marxists around are so taken by the current Israeli popular protest, which they foolishly interpret as a manifestation of the ‘Israeli revolutionary spirit’. They are convinced that now that the Israeli ‘working class’ are rising, peace will necessarily prevail. Yet in fact, what we are really seeing unfold in Israel (at least for the time being) is the total opposite of a ‘working class’ re-awakening. Indeed, some in Israel are calling it the ‘Real Estate Protest,’ because basically, those protesting want assets: they all wish to have property, a house of their own. They want to be landlords. They want the key, and they want it now. What we see in Tel Aviv has no similarity whatsoever to the struggles taking place in al-Tahrir or in Athens. At the most, the Israeli demonstrations mimic some manifestations of a struggle for justice or Socialist protest. But that is where the similarities end. Professor Nissim Calderon (a lecturer in Hebrew literature ) also presented a similar line: “We have erected a Left that has been focusing on the fight for peace, and peace only. But there is a huge hole in our struggle- we failed to struggle for social justice.” Again ‘Lefty’ Calderon refers to the social struggle within the Israeli Jewish population. The mass protest in Israel is, in fact, the complete opposite of a genuine social revolution: whilst it may present itself as a popular protest, in practice, it is a ‘populist festival’. According to reports from Israel, the leaders of the emerging protest are even reluctant to call for Netanyahu’s resignation. The same applies to security matters, the occupation the defence budget- the organizers wouldn’t touch these subjects in order not to split their rapidly growing support. What we see in Israel is neither a socialist revolution; nor is it a struggle for justice. It is actually a ‘bourgeoisie wannabe revolution’, and the Israelis took to the street because each of them wants to be a landlord, to own a property. They do not care much about politics, ethics, or social awareness, and neither do they seem to care much about the war crimes they are collectively complicit in. Malnutrition in Gaza is really not their concern either. They seem to not care about anything much at all, except themselves becoming property owners. But why do they want to own a property? Because they cannot really rent one. And why can’t they rent? It is obviously far too expensive. But why is it too expensive? Because Israel is the ultimate embodiment of a corrupted, hard speculative, capitalist society. And I guess that this is the real untold story here. If Zionism was an attempt to solve ‘the Jewish Question’ , as the author Shahid Alam so insightfully explores, it has clearly failed since it has only managed to relocate ‘the Jewish Question’ to a new place, i.e. Palestine. Israel, that was supposed to be the state of the Jewish people, has become a haven for the richest and most corrupted Jews from around the world: according to The Guardian, “out of the seven oligarchs who controlled 50% of Russia’s economy during the 1990s, six were Jewish.” During the last two decades, many Russian oligarchs have acquired Israeli citizenship. They also secured their dirty money by investing in the Blue & White financial haven. Wiki leaks has revealed lately that “sources in the (Israeli) police estimate that Russian organised crime (Russian Mafia) has laundered as much as US $10 billion through Israeli holdings.” (3) Mega-swindlers such as Bernie Madoff have been channeling their money via Zionists and Israeli institutions for decades. Israel is also a leading trader in blood diamonds. Far from being surprising, Israel is also the fourth biggest weapon dealer on the planet. Clearly, blood diamonds and guns are proving to be a great match. And it doesn’t stop there — every so often, Israel is caught engaging in organ trafficking and organ harvesting. Increasingly, Israel seems to be nothing more than a vast money-laundering haven for Jewish oligarchs, swindlers, weapons dealers, organ traffickers, organised crime, and blood-diamond traders. But on top of that, rich Jews buy their holiday homes in Tel Aviv and Jerusalem: there are reports that in Tel Aviv alone, thousands of holiday properties are empty, all year round, while native Israelis cannot find a roof. The Israeli people are yet to understand their role within this horror show: the Israeli people are yet to grasp that they are nothing but the foot soldiers in this increasingly horrendous scenario. They do not even gather that their state maintains one of the world’s strongest armies, to defend the assets of just a few of the wealthiest and most immoral Jews around. I guess that it is not surprising that within such an inherently greedy and racially oriented society, the dissent that manifests will inevitably, also be reduced to sheer banal materialism. It seems the Israelis cannot rescue themselves from their own doomed fate, , because they are blindly hijacked by their own destructive culture. As myself and a few others have been predicting for a decade or more, Israeli society is about to implode. It is really just a question of time. Gilad Atzmon’s latest book is The Wandering Who. 1. Marxist Zionist Ber Borochov (1881-1917) argued that the class structure of European Jewry resembled an inverted ‘class-pyramid’, a structure in which a relatively small number of Jews occupied roles within the ‘productive layers’ of society as workers, whilst a significant number were settled in capitalist and speculative trades such as banking. Massive demonstrations across Israel against the high cost of living point to a revival in the fortunes of the country’s long-dormant left-wing movement, forcing Prime Minister Benjamin Netanyahu to focus on economic policy at a time when he enjoys broad support for his handling of policy toward the Palestinians. In a break with an older generation of Israeli leftists, demonstrators initially dismissed as spoiled youths in Tel Aviv have reached across the country’s left-right divide by focusing exclusively on pocketbook issues rather than contested Jewish settlements in the West Bank. Although Mr. Netanyahu’s coalition doesn’t appear in danger in the short term, it could become vulnerable if the economy plays a role in the next election. Prime Minister Benjamin Netanyahu established a committee to examine the demands of leaders of the social justice protest movement following one of the largest demonstrations in Israel’s history. Netanyahu at the start of the regular weekly Cabinet meeting on Sunday morning announced the formation of a 15-member panel to review the demands, and to submit proposals in the next month for social and economic reform. The previous night, an estimated 300,000 demonstrators protesting the rising costs of living had gathered in Tel Aviv, with another 20,000 protesting in Jerusalem and several thousands more in cities throughout the country. Protest leaders have already decried the committee, saying that they are looking for direct dialogue with Netanyahu. The committee will be headed by Professor Manuel Trachtenberg, chairman of the National Economic Council, and made up of Cabinet ministers, observers and economic experts. Announcing the formation of the committee, Netanyahu said, “We are aware of the fact that working couples with children are finding it difficult to finish the month. We recognize the plight of students who cannot pay their rent. We are aware of the distress of the residents of neighborhoods, of discharged soldiers and others. We want to provide genuine solutions. On Saturday night, Israeli musicians Shlomo Artzi, Rita and Yehudit Ravitz entertained the demonstrators, who also heard speeches from Daphne Leef, founder of the movement, and Rabbi Benny Lau, founder of the Beit Morasha social justice institute. “If I could, I would show you how people have demanded social justice since the origin of Judaism,” Lau told the crowd. “In recent weeks we have witnessed public protests that are giving expression to genuine distress. The distress is focused on the cost of living and the cost of housing but it has many other aspects. I understand this distress; I am attentive to it, as is the Cabinet. We started to deal with several of the problems when the Government was formed; for example, housing reform, the plan that saved higher education and a plan – for roads and railways – that is now bringing the periphery closer to the center. However, there are additional areas that need to be dealt with. It is impossible to ignore the voices coming from the public and there is no reason for doing so. We want to give genuine solutions. We will give them. I would like to give these solutions, in a thorough – not cosmetic – way, i.e. a genuine change in the order of priorities, a change that will ease the economic burden on Israelis. We are aware of the fact that working couples with children are finding it difficult to finish the month. We recognize the plight of students who cannot pay their rent. We are aware of the distress of the residents of neighborhoods, of discharged soldiers and others. We want to provide genuine solutions. Today, I am appointing a professional committee chaired by Prof. Manuel Trajtenberg. The Trajtenberg Committee will be comprised of professionals from within and outside the government. Prof. Trajtenberg will need a day or two to complete the list of outside experts. This Committee will hold a broad dialogue with different groups and sectors within the public. The committee will listen to the distress and to proposals, and will make recommendations that will be submitted to the Social and Economic Cabinet chaired by Finance Minister Yuval Steinitz. After the Social and Economic Cabinet hears these proposals, final recommendations will be formulated and submitted to me. I intend to submit the plan to the whole Cabinet. I want full Cabinet backing for the major change that we are about to bring to the Israeli economy. I would like to say a few words why I chose Prof. Trajtenberg to chair the Committee. Manuel is a rare combination of an economist and a man with social sensitivity. Until recently, he chaired the National Economic Council. Afterwards, he took it upon himself to save higher education, which had been in deep crisis for a decade, and did so in exemplary fashion. Indeed, there is a change and everyone can see it. Much of this is due to you, Manuel. You outlined a vision and brought the solution. Manuel is familiar with the Government as well as the public. He also believes in the idea of the roundtable, or, I should say, round tables, since I will need to open many round tables in order to listen to many people, within a short time. My request is that the recommendations of the professional committee that you will chair be brought to Social and Economic Cabinet and afterwards to the entire Cabinet within the next month. This is not a lot of time. The workload will be heavy but I know that it will be done with great effort, in order to really bring about change. This change must be focused on several areas that I will define to the Committee. First, proposals to change the list of priorities in order to ease the economic burden on Israelis. Second, change the combination of tax payments. Third, expanding access to social services. Fourth, increasing competition and efficiency in the markets for goods and services in order to reduce prices. Five, steps to implement the housing plan that we have already launched. I add that the team’s recommendations will give expression to the need to maintain fiscal responsibility in the state budget. Responsibility is especially necessary in a period of economic uncertainty. We are in a period of economic uncertainty. Yesterday, something happened which had not occurred in the previous 70 years, since countries began to receive credit ratings. The credit rating of the US, the greatest economic power in the world, was lowered by Standard and Poor’s. This event joins with the crisis that is spreading to the major economies of Europe. It is possible that 120-130 million Europeans live in countries that are on the verge of bankruptcy and mass unemployment. Therefore, we must act with economic responsibility here while making the corrections that express social sensitivity. We must act in two spheres simultaneously. It is very difficult to build an economy. I have dealt with this, along with many of you. We dealt with building the Israeli economy. Twice, we led it from severe crises, in 2003 and in 2008. We did so successfully. We built the economy. The economy is strong and it withstood these crises as it will yet withstand others that await us. However, we know that we must make the internal corrections. As we succeeded in crossing stormy economic waters, we will also make the social corrections, with sensitivity, and with responsibility. I am convinced that we will succeed. A last remark. We will be unable to please everybody. One cannot please everybody. It is impossible to take the sum total of the demands regarding all the distress and say, and boast, that we can meet them all. We will listen to everyone. We will speak with everyone. We will hold a genuine dialogue, not pressured and perfunctory, but we will really listen both to the distress and to the proposals for solutions. In the end, we will consider practical solutions. Practical solutions require choices. They also require balance. Professor Trajtenberg: “In recent weeks, we have witnessed a very strong, very impressive and unconventional process that has taken place in Israeli society and among the Israeli public. What clearly arises from it is that on the one hand, there is the expression of frustration, pain and disappointment that a reasonable economic existence seems distant, even uncertain, for young working families. On the other hand, there is, within this process, the expression of a very tangible yearning, hope and longing for social justice. Pain on the one hand and longing on the other signify a great potential for a change for the better within Israeli society. To a large extent, this depends on the ability to translate these genuine feelings from the language of protest into a language of deeper professional understanding and eventually into the language of action, policy and implementation. The translator’s task is not easy. The dictionaries of the past will not help. They failed. We must find, we must perhaps invent the Rosetta Stone that will allow us to do the work. Mr. Prime Minister, I decided to accept this task and this is a tribute to your powers of persuasion and your Finance Minister’s entreaties. But I admit that I do so with mixed feelings. On the one hand, I do so with great excitement because we have before us a rare opportunity to bring about genuine change in our dear country. On the other hand, I do so with a deep awareness of the great responsibility that this task entails, given the expectations and the risks.